During a Web chat hosted by Edmunds.com during last August, Bell reveals the facts, features and a secret or two about the exiting new pickup model. As the Marketing Manager for the F-150 line and creator of the new model, he’s privy to pertinent information. First, let’s review the common knowledge. The F-150 Tremor delivers the power of a V8 with economy of a V6, thanks to the twin turbocharged direct injection EcoBoost engine, channeled through a 4.10 rear axle with an electronic locking differential. With its short wheelbase, regular cab and FX trim and features, the Tremor has a striking appearance especially after the Tremor graphics are added. 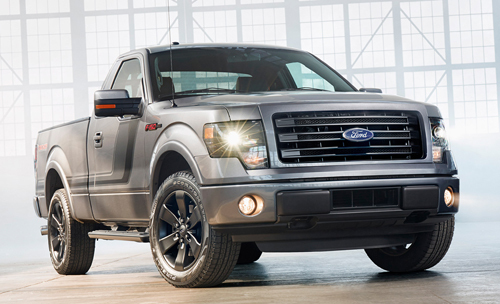 The F-150 Tremor is Ford’s only regular-cab with a flow-through center console and bucket seats. Other interior amenities include black leather seats with contrasting red piping, matching steering wheel, brushed-metal accents plus the added texture and style of Alcantara seat inserts. So why is it called Tremor anyway? The EcoBoost engine in the Tremor delivers 365 hp at 5,000 rpm using regular fuel. “The 365 hp and 420 ft.-lb of torque ratings our rated on regular 87-octane gasoline, however customers looking for some additional punch can put premium fuel in,” Bell replied to a query about fuel grades. Up to 90 percent of the engine’s peak torque is available from 1,700 rpm to 5,000 rpm. “We are confident that Tremor will do 0-60 in under 6.5 seconds – a speedy truck,” added Bell. Was it based on the Lightning or Raptor in any way? Bell also revealed there are no plans to produce the Tremor with a larger cab or engine at this time. It will tow up to 8,000 lbs with the 4x2 model and 7,700 lbs with the 4x4. It will come with optional spray-in or drop-in bedliners and will be built exclusively at the Dearborn plant this year. Sorry no green, orange or purple. Why does it cost $38,000 – because it comes loaded standard! If you want to see it in action or up close, you’ll have two opportunities this weekend. “Be sure to look for it this weekend during Saturday's NASCAR Truck Race and all weekend at the Woodward Dream Cruise,” Bell concluded.